It would seem the best time to turn your attention to orthodontic problems with your child is when their permanent teeth have come in around early puberty. In fact, you should be attentive much earlier at around 6 years of age. Here are 3 reasons why an early orthodontic evaluation could be beneficial to your child’s dental health. We may be able to detect the first signs of a malocclusion. 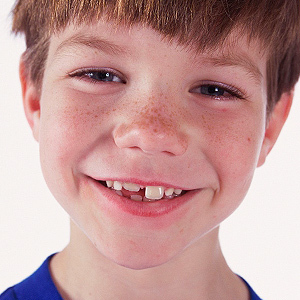 Also known as a poor bite, it’s possible for an experienced dentist or orthodontist to notice the beginning of a malocclusion as the permanent teeth start coming in between ages 6 and 12. Crowding of teeth, abnormal space between teeth, crooked, protruding or missing teeth are all signs that the teeth are not or will not be coming in properly and some type of treatment will eventually be necessary to correct it. We might spot problems with jaw or facial development. Not all malocclusions arise from faulty erupting teeth position: sometimes they’re caused by abnormal development of the jaw and facial structure. For example, an orthodontist can detect if the upper jaw is developing too narrowly, which can create a malocclusion known as a cross bite. The difference in the source of a malocclusion will determine what present or future treatment will be needed. We can perform “interceptive” treatment. While braces won’t typically be undertaken until the permanent teeth have come in, there are other treatments that can “intercept” a growing problem to eliminate or lessen future treatment needs. Orthodontists may recommend appliances that help guide incoming teeth, coax impacted teeth to come in fully or expand portions of the upper jaw to normal dimensions. As with other areas of health, the earlier orthodontic problems are found the better the chances of a successful and less interventional outcome. By having your child examined orthodontically you may be saving money and future difficulties.